In a medium saucepan, melt the butter over medium heat. Add the flour to make a roux and cook, stirring, about 1 minute. The roux should have a wet sand consistency. Add the chicken broth and lemon juice. Bring to a boil, then reduce to a simmer and whisk constantly until thickened, about 5 minutes. Set aside. Season both sides of the chicken cutlets with salt and pepper. 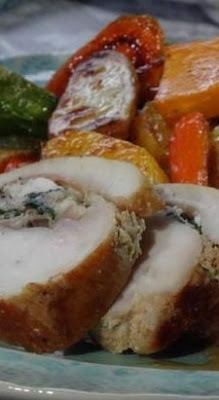 Lay a slice of prosciutto on each piece of chicken, spread with some ricotta and top with some spinach. Roll up each cutlet and secure with a toothpick. 0 Response to "Chicken Saltimbocca reipe"